As a secondary input device on my Mac: I spend quite a bit of time reading on my Mac, so it’s very nice being able switch apps and scroll through documents sitting comfortably with my iPad in my lap, rather than hunched over a desk using the keyboard and mouse. As a remote controlling a conference room computer: My company’s conference room has a large screen TV connected to a Mac mini which we use for meetings and presentations. Whenever I need to control the presentation, rather than pass around the keyboard and mouse, it’s so much more convenient to simply fire up Remote Conductor on my iPad and take control. As a remote controlling a Mac media center: I have an old Mac mini connected to the TV in the bedroom, and using Remote Conductor to control it is so much more convenient (and cheaper) than using a wireless keyboard and trackpad. The Remote Conductor app works over Wi-Fi by communicating with a small server app that runs on your computer. (The app’s developer has promised a Windows-compatible server app; I have only used the Mac version.) Pairing the iPad app with the server app is a quick process that’s similar to pairing a Bluetooth device. Once the two pieces are connected, Remote Conductor provides three modes—trackpad, launcher, and switcher. The Ol’ Switcheroo: Among its more useful capabilities, Remote Conductor can act as an application switcher for programs running on your computer. In trackpad mode, moving your finger across the iPad’s screen moves the mouse pointer across the remote screen. The app offers the usual trackpad behaviors—tap once to click, tap twice to double-click and drag with two fingers to scroll. Less intuitive shortcuts include a four-finger-swipe option; swiping upward displays the Desktop and downwards shows the Exposé screen. Other multi-touch options can be set in the app’s preferences and a handy reference of all the options is available one tap away. Tapping a Rocket Ship icon puts you in launcher mode and gives you access to all the apps installed on your computer. The server app keeps an inventory of the applications located in your dock and within your Applications and Utilities folders (and the Developer folder if you have the Xcode developer tools installed). 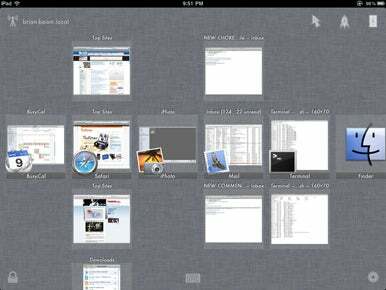 Application icons are displayed in an iOS-style grid on your iPad, and dock icons appear in a dock along the bottom of the screen. App icons are spread among several screens and, in typical iOS style, you move among those pages by swiping left and right. Tapping once on an icon launches that app and then switches Remote Conductor into trackpad mode. There are a handful of applications that I use on a daily basis. Not wanting to wade through multiple screens of icons, I created a folder containing aliases of those apps and then added that location to the server app’s preferences. That approach works fine; however my custom screen always appears at the end. It would be nice if I could move that screen to the beginning. My favorite use of Conductor is as an application switcher. A tap of the Light Switch icon displays a scrolling list of all the apps running on your computer and their windows. A live-updating thumbnail of the most recently used window of each app appears in the middle of the screen. Thumbnails of other open windows appear both above and below the app’s primary thumbnail in the middle. Clicking on a thumbnail brings that window to the foreground. This process also works very well with minimized windows and those spread among multiple Spaces. The switcher provides quite a few other options which are easier to see than to describe, so the developers have put together a useful YouTube video that shows the switcher in action. Regardless of which mode you’re in, a small keyboard icon appears at the bottom of the screen which brings up the familiar onscreen keyboard. It works as expected but there’s currently no support for keyboard shortcuts (like Command+S to save or Command+Q to quit, for example.) This feature is forthcoming according to the developers. Remote Conductor isn’t without its minor quirks. I occasionally have trouble dragging windows with the default tap-hold-drag technique. (The optional three-finger-drag setting works reliably, though.) And if I have too many apps open on my iPad, then the launcher sometimes refuses to load. (This is a known issue. Freeing up memory by quitting unused apps always does the trick.) Despite these few very minor annoyances, I love Remote Conductor. And the developer is very responsive to its customers, quickly fixing bugs and adding new features. So, iPad owners who have been contemplating the purchase of a Magic Trackpad, I seriously urge you to take a look at Remote Conductor. For one-tenth the price, it provides three times the functionality. Now that’s truly magic.